The mid-nineteenth century is both very near and very remote, as we realise in this study of Ned Corvan (sometimes spelt Corven). The society depicted here is only two lifespans away – my grandmother (who went into the mill aged eight – factory at 6.00 a.m., school in the afternoon) was born into the world of Corvan’s children. Yet the differences, in physical experience and in ways of thinking, are immense. Dave Harker, who regrets that “today most north-east children have to follow the ‘National Curriculum’ and focus on the history and culture of London”, has rescued from oblivion a remarkable figure. 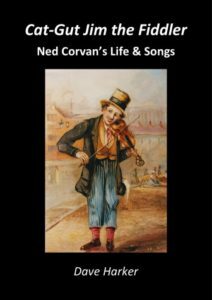 Ned Corvan was a singer, comedian and artist. Born in 1827, he died aged only 37 – largely as a result of his excessive use of alcohol and tobacco – but having established a substantial reputation. Dave Harker will be known to many for his work on Robert Tressell and the Shrewsbury pickets, as well as his study of the origins of Bolshevism but he has also written a number of books on the history of popular music, for example his study of George Ridley reviewed here. The book is based on an immense labour of research, and is beautifully illustrated with reproductions of original documents. Harker presents his material in a somewhat disconcertingly staccato style, confronting his readers with a mass of information that builds up a picture of Corvan’s life and its material context. Life for working people was miserable. There were diseases like cholera, pit disasters like that at Hartley Colliery in 1862 when 204 died, and above all grinding poverty – when miners struck in 1844 they were turned out of their homes and had to live in tents. But there was resilience, and then as at many times that resilience took the form of laughing and singing – comedy and music, the two themes of this book. Corvan lived before even the most primitive forms of recording device described in Harker’s penultimate chapter. He could scarcely have imagined the world of today, when half the population walk the streets with what we used to call gramophones on the top of their heads. If people wanted to hear music they went to the theatre. The Tyne Concert Hall held 2840 people; at Nelson Street Music Hall “Ladies and Gentlemen” paid sixpence and “the Working Classes and Children” paid threepence. He also recreates aspects of the music industry. Thus he quotes a letter about performers who “write to distant managers for situations at extravagant terms …. arrive, make their first appearance to an astonished public and petrified manager, who discovers, when too late, that he has been made the dupe of a miserable trickster” – the Stranglers were doing much the same thing a century and more later. Modern readers will wince at some of the language used to describe black musicians – and at the occasional references to Jews. But we also read of the Alabama Minstrels, advertised as the “only Troupe of Real Blacks in England”, and it is clear that black musicians exercised an important influence on English popular music. The milieu was against slavery and sympathetic to radical figures like Garibaldi. He combined humour and pathos. Comedy depends very much on context – imagine someone in a hundred years’ time reading Private Eye and needing footnotes to explain who Boris Johnson was. Lines like “When a chap begins ti tawk aboot eatin’ cats, it’s a sign he’s gannin’ ti the dogs” may be a bit flat on paper, but we are assured that audiences were “never tired” and some were “convulsed” with laughter. The North-East dialect rendered phonetically is a bit of an obstacle but is easily got used to. Corvan’s songs confronted some of the major questions of the day. He was an anti-militarist; his song He wad be a noodle mocks a young man who wants to be a soldier, but in a shooting competition “He fired reet past the target an’ kill’d an aud cow”. Corvan now lies in an unmarked grave beneath crumbling tarmac. But Harker has brought back to life his combative spirit.